As a trainer I am always thrilled to find beautiful methodologies and inspiration from gifted teachers. Do you know the 10 beautiful rules by Corita Kent? As a trainer and lecturer i live by this. I post them for you as a PDF. 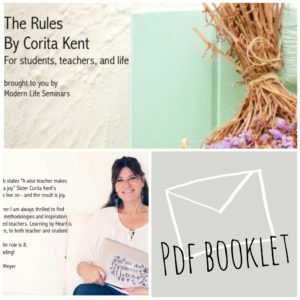 Just click here on the 10 RULES by CORITA KENT – brought to you by Modern Life Seminars. If you like them and find them inspiring, save the PDF to your desktop or forward it. Sister Corita Kent’s teachings live on – and the result is joy. I love how it says that even though this is a list of rules, you don’t even have to follow them. More information: If you are interested to know more about Corita Kent, Maria Popova has the full story check it out. If you want to read the rules in German, check out this FAZ Article.